Well, that little internet break turned into quite a long one! But I’m back with something you have never seen on my blog- vacation pictures! Yes, the stars aligned, so Gwensdad and I were able to take our first vacation in 12 years to beautiful Asheville, NC. I went to summer camp in the area and we had been there the year before Gwen was born and always wanted to go back. Asheville is a small mountain city with beautiful vistas, an abundance of wildflowers, wonderful restaurants and best of all mild temperatures with low humidity. We stayed in a cabin with rocking chairs on the upstairs porch and a hot tub on the downstairs porch. We only had two days to play, so we skipped the main attraction, the Biltmore House, as we had been there already. Instead we visited the North Carolina Arboretum, an extensive botanic garden, forest area and regional green resource. This place is a regional treasure and it blew us both away. 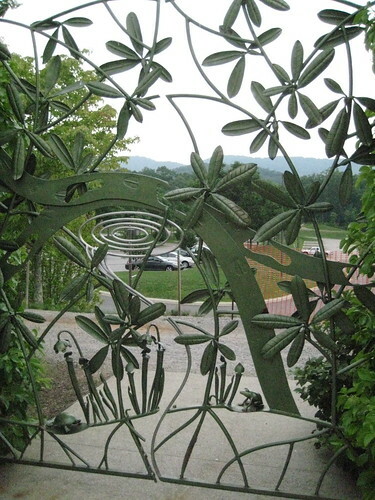 The core garden area is flanked by an array of stunning gates made at the Penland School of Crafts. 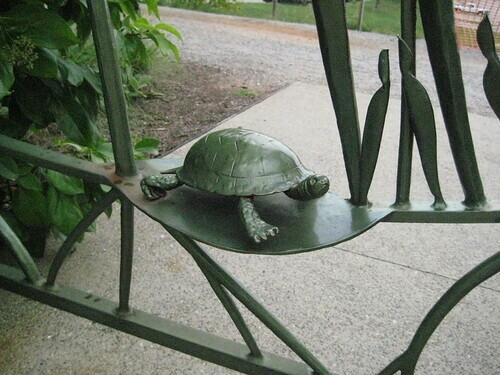 This one represents the area’s wildlife and natural resources. 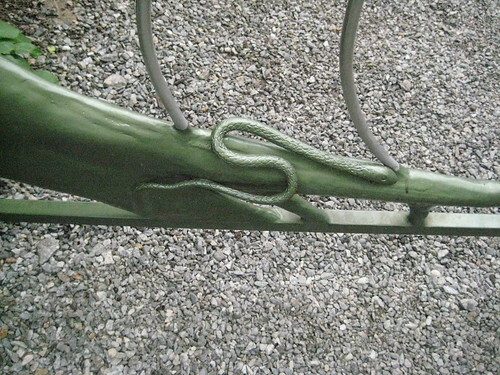 Here is a fabulous piece of sculpture by Martin Webster. 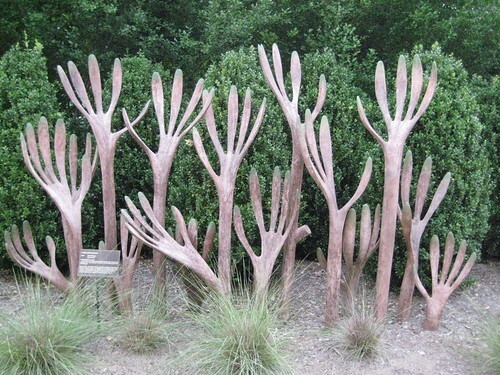 Read about it and all the other fabulous garden art on the Arboretum’s art page. Finally, the quilt garden, planted with quilt block designs. New blocks are installed four times a year. 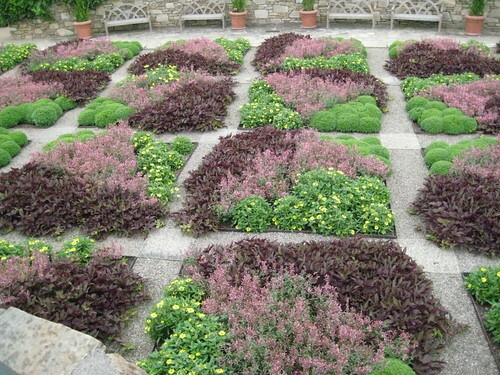 The darker foliage in these squares is sweet potato vine and the small shrubs are a fragrant basil that scented the entire area. Our visit was cut short by rain, but there was so much else to see! 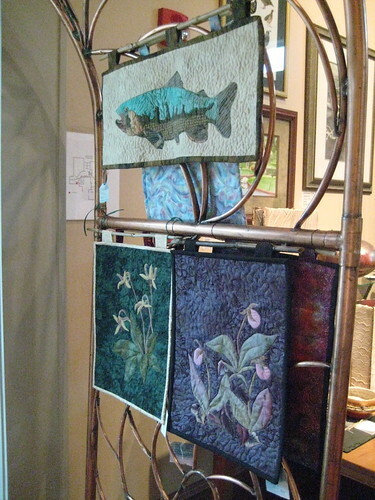 Including these lovely art quilts in the gift shop. This amazing place is a jewel. 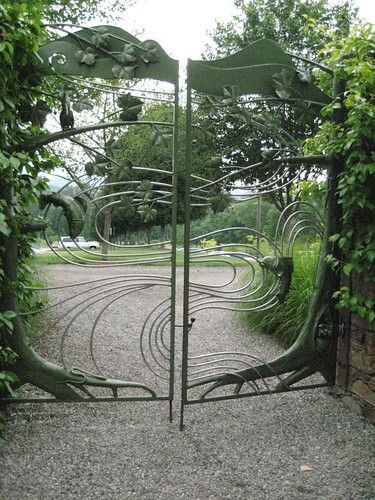 I am longing to go back to hike the trails and browse the gardens we didn’t have time to see. At $6 per carload of people, it is real bargain that you won’t soon forget! This entry was posted on August 10, 2009 at 9:16 am and is filed under Uncategorized. You can follow any responses to this entry through the RSS 2.0 feed. You can leave a response, or trackback from your own site. oh first to comment I like that. dont forget only 137 days to Christmas lol. Glad you had such a fabulous getaway! Those pictures are gorgeous. Gosh, you must have a great camera (or are you just that good a photographer)lol. AND how sweet that your hubby takes an interest in that. If we went to No. Carolina, my husband would want to go to a NASCAR event!!! Very cool garden!! You’d love it if you could get to Skagway AK — they have 2 VERY awesome quilt stores there! !